Share this product and receive a $1.55 sharing discount. 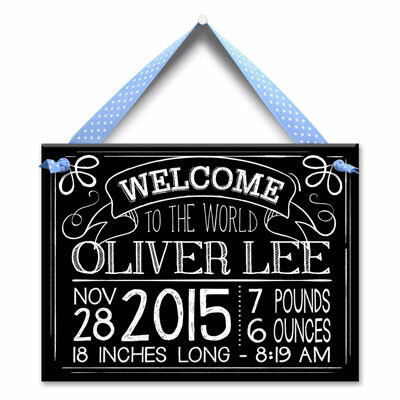 Add a playful touch to any child's room with a personalized Little Worm and Company wall tile celebrating baby's birth. This ceramic wall tile is hand-painted and signed by children's artist Kathleen Virtue. Her trademark is the extra detail she is able to show on each design by using tiny brushes for those special finishing touches. 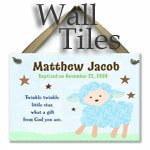 You can personalize this colorful baby wall tile with the child's name and baptism date. The tile size is 8" x 6." This wall tile is a one of a kind... handpainted and personalized in the US just for you. Understandably, personalized items cannot be accepted for return; however, if your order is not 100% accurate due to our error, you may return it in new condition and in its original packaging for a prompt exchange. EVERY ORDER REQUIRES 10 BUSINESS DAYS FOR MANUFACTURING. THE COUNT BEGINS THE DAY AFTER YOU PLACE YOUR ORDER. SHIPPING TIME IS NOT INCLUDED IN THE 10 DAYS.